A Victorian copper, fancy border, ring mould dating from c.1880. This mould doesn't have any manufacturers marks but it is stamped 'R.P'. These would be the initials of a previous owner. The design to the top is known as a penny top as it looks like a circle of overlapping pennies. This design came in many forms, shapes and sizes. This one is quite simple, with fluted sides. This design looks very good when hanging. 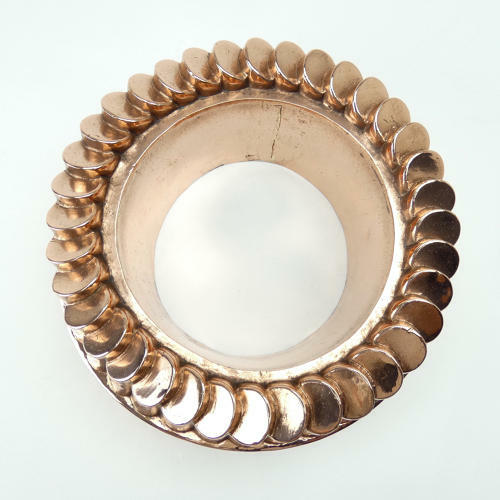 The mould is made from a substantial gauge of copper and it has a brased seam up the inside. There are a couple of very small dents to the side of the mould but other than that it is in good condition. A small hole has been pierced in the side so that it can be hung and the tinning, to the interior, is worn so it could not be used.